1. 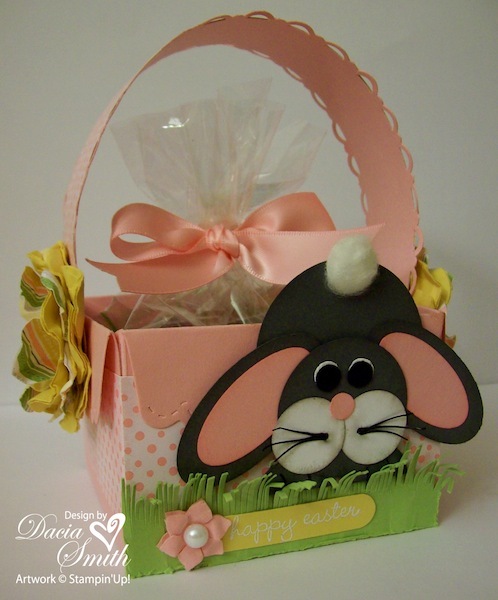 The basket is created using the Scallop Envelope Die. Put it together by cutting 4 envelopes with the Big Shot, remove left side tab on all four, attach right side tabs to left sides with Sticky Tape, fold in bottom tabs, and seal. The handle’s lace is done with the Scallop Trim Punch. Only two more days to get this free with a qualifying order during sale-a-bration. The handle is attached with a Pretty in Pink Corduroy Brad through a flower punched with the Extra Large Fancy Flower Punch from the Occasions Mini Catalog. 2. 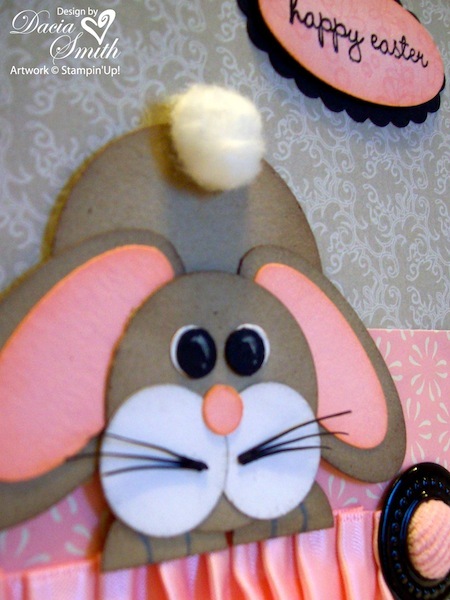 The bunny follows Mercedes pattern with a Basic Gray fur coat. He’s perched in Certainly Celery grass trimmed with Stampin’ Up’s Paper Snips. The flower is a blossom from the Boho Punch with a Pretties Kit pearl. 3. The treat is fancy truffles from a local sweet shop wrapped in a Medium Cellophane Bag and tied with another yummy Pretty in Pink Satin Bow. Hope my children enjoy their fancy Easter basket treats. Today’s share follows Sketch Challenge #62 over at the sweetest thing… Join in on the fun and play along! 1. 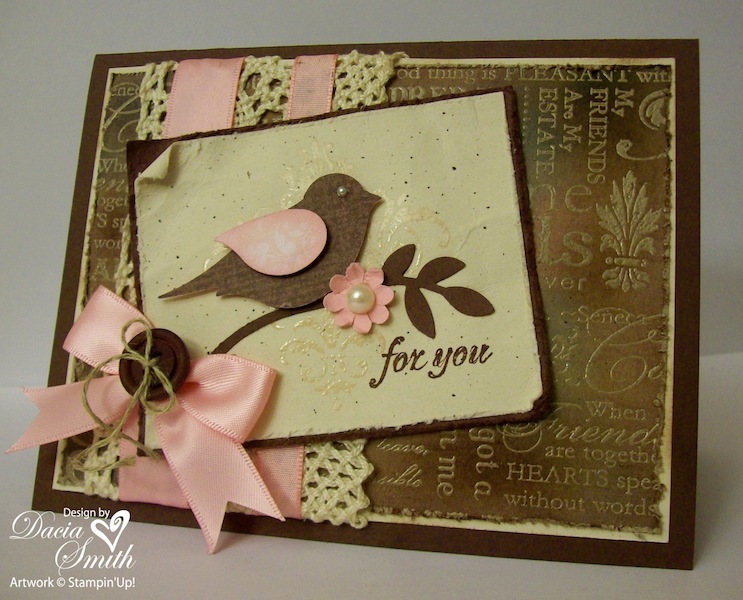 The bird is created using the Extra Large Two-Step Bird Punch from the Occasions Mini Catalog at Stampin’ Up. I experimented with some retired designer paper from Bella Rose to create a variegated look on the bird. What do you think? 2. 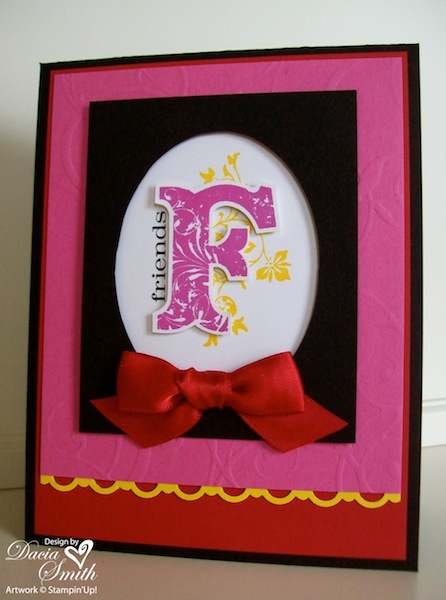 The Kraft background is rolled with the Friendly Words Wheel in Versamark and embossed with Clear Powder. Next it is sponged using several colors. Finally the Distressing Tool is dragged down each side for a unique vintage look. 3. The Pretty in Pink Satin Ribbon ties the yummiest bows. This one is layered using a button from Button Latte for a home spun vintage appeal. It is attached to the bow with Linen Thread. Playing around with Stacey’s Curtain Call Color Challenge Act 23 today. The colors this week are Basic Black, Kraft, Pretty in Pink, and Whisper White. Hope you’ll take some time and play along. 1. 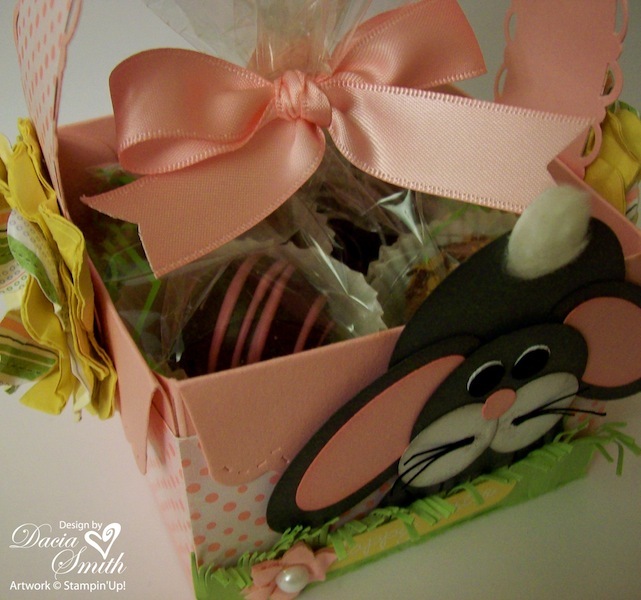 The bunny was created using Stampin’ Up’s standard punches. This little guy is compliments of Mercedes Weber, and you can get all the details here. 2. The Jumbo Grommets add whimsey and fun to all of your creations. Use the grommets with any 1/2″ embellishment for a cool layered look. This one is paired with the Pretty in Pink Corduroy Buttons from the Occasions Mini catalog. 3. Pleats are in! Today’s card uses the Pretty in Pink Satin Ribbon. The pleat is easily achieved by placing a piece of Sticky Strip across the card and gently folding the ribbon back and forth applying as you go. 1. The Paper Snips are the trick to trimming out layered images. If you will turn the paper rather than the scissors the curves are a snap, and the narrow point allows you to snip the tightest places. 2. The Pink Passion is embossed with a Backgrounds 1 Texturz Plate. I find the Big Shot coming to the rescue in so many card and project ideas. 3. I’m a little out of my comfort zone when working with Stacey’s color challenge, and the bold colors added another level of difficulty. I’d much rather participate with a sketch. I guess that’s why it’s called a challenge! Hope you like what I came up with today. 1. My Good Friend Stamp Set needed a little love tonight so I stamped several elements together to create the funky designer paper. I then paired a couple of solid patterns to match. I just love how it turned out. What do you think? 2. The lower strip of Rich Razzleberry was embossed with the Backgrounds 1 Texturz Plate. The Old Olive Satin Ribbon and Scallop Trim Punch added just the right touch to dress up the card. 3. The flower is from the Cheep Talk stamp set. It is stamped three times in varying strengths of Rich Razzleberry and trimmed with Paper Snips. After distressing and layering the blooms, a little Crystal Effects was added to the blossom center. 1. 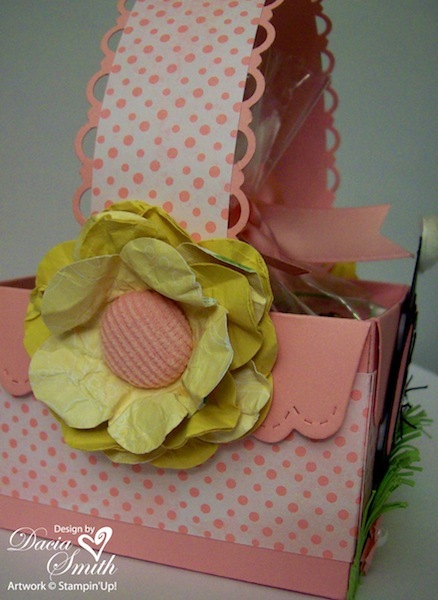 We are putting this together at the Easter class tomorrow. All my downline gals and those coming to class will receive the free pattern. The quick designer paper was created using the Bella Toile Background Stamp. After cutting out the pattern, it was stamped, and then assembled. I just love the effect! 2. The hanger is made with Old Olive Satin Ribbon. I was so excited to learn it will be carried over to the Summer Mini Catalog. It is one of my favorite offerings. The ribbon comes in 10 lovely colors to create bows is a snap. 3. The tag was created with the Sale-A-Bration set Vintage Labels. It is free with a qualifying order until March 31. Each stamp in the set has a coordinating punch to make easy tags and embellishments. 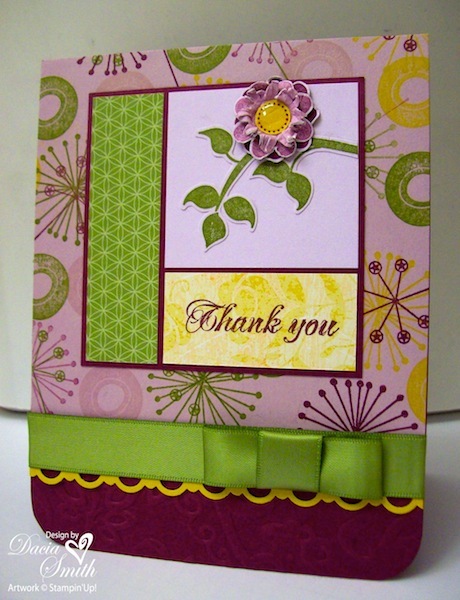 This card’s inspiration is from Karen Giron’s Sweet Sunday Sketch #60. 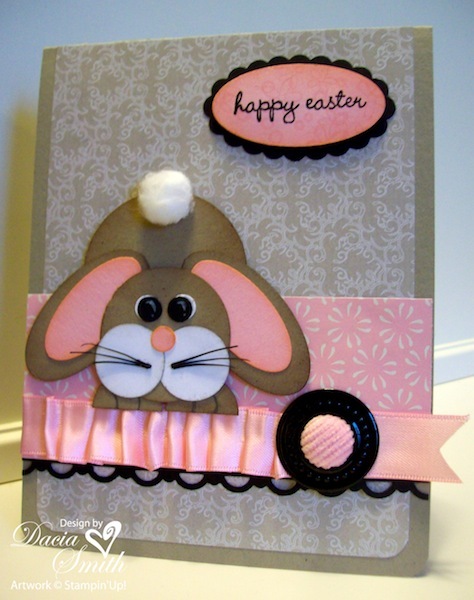 What a great sketch to show off Stampin’ Up’s Eggcellent Easter Kit. Hope you’ll have time to play along this week. Happy St. Patrick’s Day. I’m wearing my green. 1. 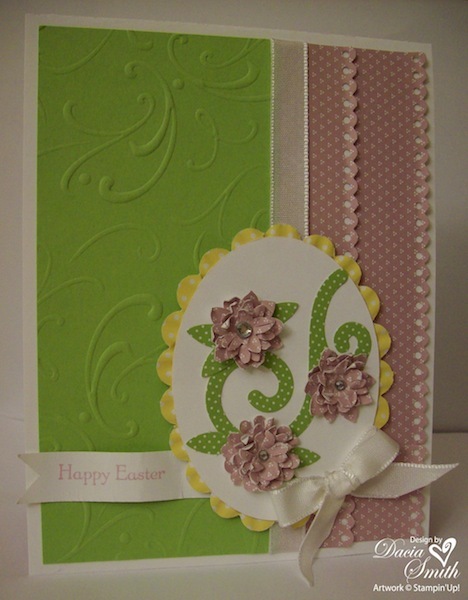 The Eggcellent Eggs Kit has all the supplies you need for beautiful Easter cards. Layer up the die cut blooms and apply the distressing technique to create a carnation blossom. Add a finishing touch with the rhinestones included in the kit. 2. The Eggcellent Eggs Kit also contains egg stands that double for lace strip embellishments. To achieve the 5 1/4″ length, just add on an inch from another strip. The kit contains four pages of stands in five colors. I just love the soft purple and green together. 3. The sentiment is from the Teeny Tiny Wishes Stamp Set. This is a must have, it has a greeting for almost every holiday. What a bonus!